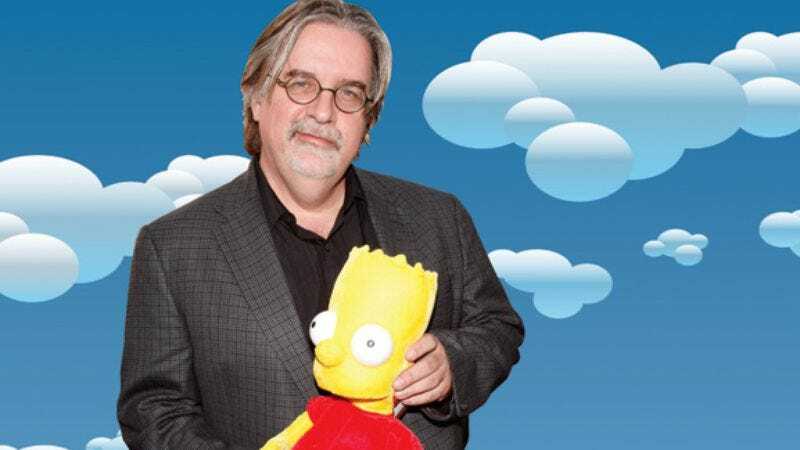 2009 is a year of milestones for Matt Groening: his 55th birthday, The Simpsons’ 20th anniversary, and the fourth (and possibly final) Futurama movie, Into The Wild Green Yonder. The year demands a certain amount of reflection, though it takes little effort to see the effect of his work. The Simpsons has had a seismic impact on pop culture; it redefined the television landscape after it debuted as a series on Fox in 1989, and it’s become one of the most important and successful series in history, with a legion of dialogue-quoting fans that outnumbers the world’s armies. And Groening has had considerable success elsewhere. He still writes and draws his comic, Life In Hell (which predates The Simpsons by more than a decade) every week, even as the newspapers that carry it die off. His second animated series, Futurama, debuted in 1999 and ran for four seasons before Fox canceled it, but as with Family Guy, robust DVD sales and syndication gave Futurama new life. It returned in 2007 as a direct-to-DVD movie, Bender’s Big Score, which was subdivided into half-hour episodes for Comedy Central. Three more films followed: The Beast With A Billion Backs and Bender’s Game in 2008, and Into The Wild Green Yonder in March 2009. Before its release, Groening spoke to The A.V. Club about the future of Futurama, the hostility of humor, and why The Simpsons isn’t as funny as you remember it. The A.V. Club: So, Futurama: Is this it? Matt Groening: If this is the final appearance of Futurama, it will be bittersweet but satisfying, ultimately. David Cohen, the co-creator of Futurama, and I always felt that we really had the rug pulled out from under us when Futurama got cancelled. It was such a relief to be able to tell some of the many stories we didn’t get to tell. We have now worked our asses off for the last few years doing these movies. If we don’t get to do more, we will have some regrets, but we got to say a lot of what we wanted to say. On the other hand, if Fox does want to make more, we would be very glad to. We still have stories that we sketched out before we even started the series that we haven’t gotten to. One of the nice things, even in these last four DVD movies, is we always felt we wanted a real emotional arc to the romance between Fry and Leela. A woman came running up to me at the San Diego Comic-Con last summer and begged me to not leave Fry and Leela unresolved. [Laughs.] I think fans of Futurama will be satisfied by the end of Into The Wild Green Yonder. It just goes to show that fanatical insanity does have its payoffs, because I really paid attention to what that woman said. AVC: If only you listened to every person that came up to you. MG: One of the great things about the Internet is that you can read what everybody has to say about everything. It is fascinating to me, the critiques about humor by people who have no sense of humor. [Laughs.] The thing is, people who can’t be funny have a legitimate need to be heard too, but some of their ideas aren’t that funny. AVC: You mentioned some regrets—like what? MG: With the science-fiction universe, a thousand years from now, we still have so many places to go. The nice thing about Futurama for me personally was that it was a way to honor some of the traditional ideas in literary science fiction, not so much movie or television science fiction—although we have that too, obviously. Our situation, a workplace comedy, led to all sorts of stuff. For instance, we made all sorts of rules in the beginning. We wouldn’t allow ourselves to do time travel, because we thought if we did time travel, all the rules would be out the window and nothing would matter. We held onto that for most of our first run, but some of our best episodes ended up being time-travel episodes. AVC: How did you decide to finally give into it? MG: Stewart Burns, one of the Simpsons writers who was a Futurama staff writer, wrote one of the best scripts when the characters go back to Roswell, New Mexico. The best science-fiction concept about that is Bender’s head gets buried in the sand in 1953 as the ship escapes into the future. They go back and search for him a thousand years in the future, and his head is still there alive, and he’s mad that they dug him up, because he was having a good time buried in the sand. AVC: Did the possibility of this being the final film affect how Into The Wild Green Yonder was written? MG: Yeah, there is some tying up of some emotional loose ends, and there is a nice final scene that’s very good, but it’s open-ended enough that if we come back… We painted ourselves slightly into a corner, but not completely. David Cohen is much more worried about the corner in which we painted ourselves than I am. AVC: That has been sort of a specialty, especially with The Simpsons: painting yourself into a corner, then jumping from it. MG: Well, the thing about a cartoon is, you can do whatever you want. The tightrope that we are walking on The Simpsons and Futurama is “How do you continue to surprise the audience, but make them good surprises?” Not every surprise is good, but you want to continue jolting people. That is a tough order. Some experiments are more successful than others. AVC: When will you have a better idea if you are coming back? MG: Maybe the next phone call I get? I don’t know. [Laughs.] We’re not holding our breath. It’s always tough in television, because it is much safer to say no. If you say yes, it is going to cost a lot of money, especially with animation, so I understand the hesitation. On the other hand, what we do is very good, and the fans really love it, and the DVDs have been very lucrative for Fox. I think they should do some more. If they’re smart, they’ll do more. AVC: How did doing all of the movies compare to what you expected when you knew Futurama was coming back? MG: We had a much smaller writing staff and much quicker turnaround time and a limited budget, so everything was done quick and cheap, but I don’t think it shows in the writing or the animation. I think it’s pretty good. One of the hurdles we had to jump was the idea that these movies were also going to be edited into episodes that ultimately are running on Comedy Central. We tried, to begin with, to construct the movies in such a way that they could be neatly, surgically cut apart. By the end with the last movie, we finally decided to make as good a movie as we could, and hope it cuts up later down the road. The movies are a little choppy because we are trying to serve two masters. AVC: It seems like that would add a ton of work. MG: Part of the process, in addition to telling a good story, being true to the characters, and coming up with jokes you haven’t done before is that you are trying to make a small movie and also make a series of small TV shows. It’s difficult. One of the very sweet things about coming back to do these DVD movies is that everybody who worked on the show before wanted to come back. Eric Kaplan and Mike Rowe and Ken Keeler, in particular, did a fantastic job on the writing. Then we had the same animators with Rough Draft [Studios] and some of the same animation directors. Peter Avanzino directed the final movie, and he did a great job. AVC: If this is it, you’ll have one less job. Do you have other plans to overfill your time? AVC: You’d just be booked instead of overbooked? MG: This is coming up on the 20th anniversary of The Simpsons. We’re gearing up for a big 20th-anniversary celebration, and last week we had our first episode in high definition, with a new main title. So The Simpsons keeps on demanding a lot of time. AVC: You’ve talked about your appreciation of animation that doesn’t render every pixel in glorious detail like Pixar and CG stuff, and The Simpsons is still cel animation. Is that part of the reason why The Simpsons didn’t come to HD until now? MG: Well, there’s an adjustment you have to make. We changed the aspect ratio, and it changes editing decisions, because so much of what happens in animation is the sudden reveal or the arrival onscreen of new characters, and quick departures. We don’t use certain kinds of animation shortcuts that you know from the great Warner Bros. cartoons, like characters zipping off, leaving a cloud of smoke. It actually changes our timing and composition, and we have to rethink everything. So it was a big step. It’s not quite as simple as it sounds. Plus, with high definition, you’ve got more things to look at, and you have to figure out how to guide the viewer’s eyes. Again, it’s daunting, but it’s exciting too. AVC: It seems like doing the movie would be a good trial run for that sort of thing. MG: Definitely doing the movie gave us some direction on how to take the show. AVC: In the future, do you think cel animation will become like black-and-white movies today, an aesthetic choice, or do you think it’s going to completely disappear? MG: Well, no. There’s always room out there for the hand-drawn image. I personally like the imperfection of hand drawing as opposed to the slick look of computer animation. But you can do good stuff either way. The Pixar movies are amazing in what they do, but there’s plenty of independent animators who are doing really amazing things as well. I think all formats will survive. AVC: It just seems so easy to dance on the grave of cel animation, like with Disney closing that whole department. You hardly ever see it anymore. AVC: Speaking of dying media, how do you think comics like Life In Hell are going to adapt? MG: Speaking as an alternative newsweekly cartoonist, we’re at the bottom of the food chain. We’re hoping that weekly newspapers don’t go the way of dime novels. It may be that the time has come and passed, but I don’t know. I hope not. It seems to me that if you have a publication with a strategy, with some enthusiasm, and some design sense, I think there is a way of keeping it alive. AVC: Do you think it will become just a web phenomenon? AVC: In an interview from earlier this year, you said if you psychoanalyze comedy, it’s mostly about anxiety and hostility at its core, which really seems to speak to Life In Hell especially. Does it just come down to laughing because, well, what else can you do? MG: I think people who work in comedy and humor are hesitant to analyze it too much, because you feel like if you take it apart, you’ll break it and not be able to put it back together again. But still, anxiety and hostility seem to be a great part of good and bad humor. Examining humor too closely does seem to destroy it. I think an example of that would be the movie The Aristocrats, the retelling of the filthy-aristocrats joke over and over again in so many different ways by all these comedians. What’s fascinating to me is not the joke, which is pretty bad, but the inability of the tellers of the joke to understand what it is they’re giving away with their own versions of the joke. [Laughs.] To me it’s like truth serum. So what that says about the work I do and the work they do in collaboration with others, I’m not sure exactly. But I will say that definitely hostility and fear are at the core. There’s a great couple of books that are really demented, ultimately, but have moments of insight, and they’re both written by Gershon Legman. One’s called Rationale Of The Dirty Joke, and the other one’s called No Laughing Matter: An Analysis Of Sexual Humor, and they’re Freudian analyses of dirty jokes. I think anyone who is a humorist or working in comedy should read these books if they want to understand better about their own internal insanities. This idea of the hostility that underlies humor is not an original idea of my own, nor his. It comes from Freud. But Legman also says “What it says about me that I’ve spent my entire life collecting dirty jokes and then writing these two volumes about them?” It’s its own problem. AVC: Are you feeling at all reflective, with the confluence of anniversaries this year? MG: [Long pause, sighs, laughs. ]You can put in the interview, “long pause.” I’ve been deadline-driven for my whole grown-up life, and that hasn’t gone away. It is nice to be able to reflect about the big picture, about what kind of stories you want to tell, and how to take advantage of success. I have ideas for a few other animated TV shows and a few movies, and I have to ask myself, is it worth the time and energy demands that would come, assuming that it would be successful? I’ve been very lucky that people I’ve worked with have been really talented and deliver the goods every step of the way. So I’m trying to figure that out: What’s the best thing to do next that’s not redundant creatively, but which is fun and will amuse the audience? AVC: You told a story once about the first pitch meeting you had with a studio. They wanted Eddie Murphy ideas, so you came up with a film where he moves to Hollywood to be in movies at the dawn of the sound era, but only lands racist gigs like a chef in a Three Stooges short, or an African native in King Kong. You were dismissed outright, but do you think you could get that made today? AVC: Do you have to interact with fewer people like that, now that you’ve attained this certain status? MG: There are plenty of disarming meetings that I go to still that have nothing to do with making jokes, but that’s part of the job. AVC: Like branding and strategy and that kind of stuff? AVC: Have you gotten to the point, though, where you’re like, “I don’t need to do this anymore”? What are you sick of discussing? AVC: I’d imagine you’re also sick of discussing Nancy Cartwright making her Scientology robo-calls using Bart’s voice. But you’d probably also see the humor in it, being a person with the beliefs you have. MG: Well, I believe in the one, true god: the mighty Thor. AVC: Did it upset you? MG: You know, all this stuff gets blown out of proportion. It’s happened before with other aspects of the show, and it’ll happen again. It comes and goes. It’s no big deal. We did an episode this most recent season, last season, in which Homer has dealings with a Muslim family. We explored a prejudice, and it was very warmly received in the U.S. But in England, some of the tabloids tried to turn it into a controversy, that it was an anti-Muslim thing. If you go online, you can see all this pretty pathetic controversy, or attempt to stir up controversy. So it comes and goes. AVC: It’s part of the territory? MG: Yup. I like the people I work with. We always say, “Let’s see how long we can keep this going. Let’s see if we can still have fun, still make people laugh, and continue doing it.” Let’s see, how do I want to put this… The criticism of the show, that it’s not as good as the show you remember when you were 9 years old, is probably true, but then no show is as good as the one you thought was probably the greatest when you were 9 years old. It’s the nature of comparing something to the thing you loved the most at the time. If the show had been cancelled after five seasons, it would be forgotten. AVC: Really? The “cut down in its prime” legacy always builds things up—look at Futurama. MG: Well, let me approach it from a different direction. Getting back to the idea about humor, I was generalizing about humor and anxiety and hostility, but the fact is, styles in humor do change. Humor does depend on surprise, and the things that people remember as the funniest things in the world, you look at later and you go, “What? What was that all about?” I mean, I love Laurel and Hardy, but I show Laurel and Hardy movies to people, to friends, and they think they’re too slow. The pacing is something they’re just not used to. They’ve had it drilled into their minds that everything has to be very cutty and quick and gross. So the relatively elegant and subtle Laurel and Hardy movies—which I can’t believe I’m even saying “elegant” in relation to them, but compared to crass comedy these days, they are—I think they’re great. The style has changed, and I certainly don’t think that people who can’t appreciate the brilliance of Laurel and Hardy are wrong. It’s just different style. If The Simpsons came on now, having never been seen before, with those original episodes, I don’t think anyone would give them a second look, because they’re so crude and primitive in their execution. But like I said, styles change, and all I ask of critics—of online critics of the show that say “Oh, it hasn’t been good since season X”—is that, in the opinion of people who work on the show, that’s simply not true. I’m not saying that every episode is better than the previous, but I’m saying that to completely out-of-hand condemn a decade of the show is a very easy position to take, and the fact is, the show has done absolutely brilliant stuff consistently throughout its history. Like I said, I’m not defending every single joke in every single episode, but if we didn’t like what we were doing, we wouldn’t keep doing it. AVC: The Simpsons didn’t go after George W. Bush as directly as his father, or Clinton in the twilight of his presidency. Why do you think that was? MG: There’s never any conscious decision to skewer anybody in particular, or hold back. We try to make the best jokes we can, given the situation. We did some mildly indirect political commentary, but there was so much of it that was done so well that I think we tried to figure out “How could we be an alternative?” You also have to look at the situation The Simpsons has found itself in: When we started back in the very end of 1989 as a series, there was nothing else like the show on TV at the time. Since then, there’s been an explosion of satirical, wild animation, which has left us in a situation of being not the wildest show out there. I mean, South Park outdoes us every step of the way. Family Guy obviously has gone completely wild with outrageous humor. Then on the other side there’s King Of The Hill, which has a muted tone and is very emotionally resonant. So how we fit into the changing pop culture and the stuff around us is increasingly difficult. AVC: Especially when South Park has such a quick turn-around time compared with The Simpsons. MG: And they’re really good at what they do. We’re all working in the same areas, so you don’t want to step on somebody else’s toes and do something that they’ve already done. Our strategy has been the strategy of most people who work in animation, I think: You can’t pay attention to what other people are doing, because if you start following other shows, it just sets up roadblocks for things you can’t do. So sometimes shows are accused of imitating other shows, and it really is not the case. I can say that across the board, because you just try to do the best job you can, and you don’t pay attention to what other people are doing. AVC: Do you think having Seth MacFarlane in Into The Wild Green Yonder will lay some of the feud rumors to rest?